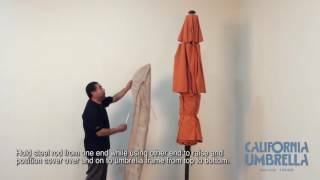 The CALI 118 is an exciting cantilever umbrella that opens up tremendous possibilities for any space. The extra-large 11’foor canopy tilts and turns 360 degrees with its peddle release to offer the most dramatic shade potential. This umbrella features a strong aluminum frame and ribs that will last you a long time. With a standard fillable base which can be filled with water, rock or sand up to 350 lb.